Anthropology in Practice: As Above So Below—Investigating "Life Underground"
As Above So Below—Investigating "Life Underground"
New York City has a reputation for being a dangerous place. You never know what may lurk beneath the streets—alligators, giant rats, even turtles and fish. The 14th Street and 8th Avenue subway station is home to one of my favorite public art installations: Tom Otterness' Life Underground at 14th Street and 8th Avenue places miniature characters in precarious situations—such as being eaten by an alligator. 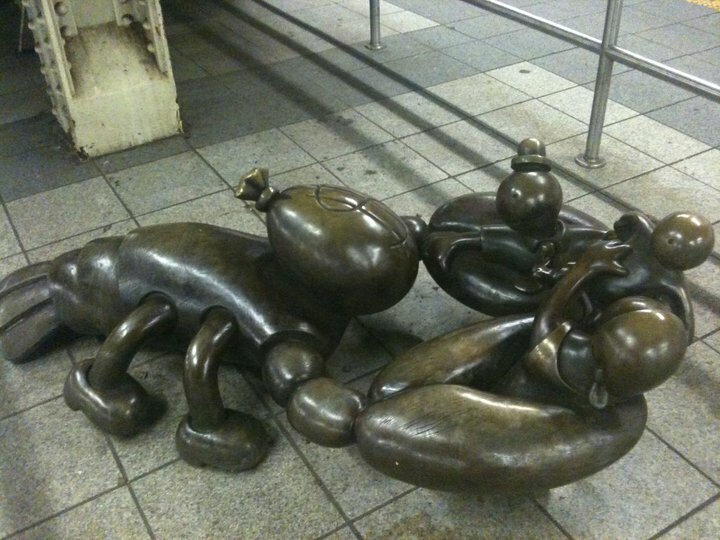 Otterness allegedly based the characters on the themes of corruption that were common during the Boss Tweed era of New York City, but these figures strike a chord with today's climate: the financial pinch that many Americans find themselves in resonates with the family caught in the claws of the scorpion with the money-bagged head. 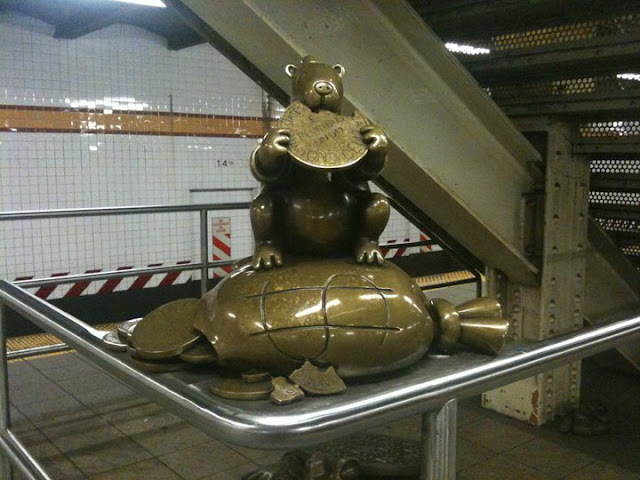 The installation has an air of subversion about it—a couple creeps out of the subway and a robber type figure sits triumphantly on a pile of coins, reading nonchalantly. There are examples of waste as money bags and coins are strewn about, and in one case need to be swept up by porters. And there are also instances of triumph and humanity, as a big figure hands out coins to a smaller figure. For more scenes from Life Underground, please visit the Facebook album—and if you're ever in the area, stop by, but watch out for that alligator.